Background: Smoking is a leading cause of preventable deaths worldwide. Graduates of medical schools receive limited training on tobacco cessation and are ill-equipped to treat tobacco dependence. In this paper, we describe and present evidence from an educational intervention based on a train-the-trainers model and problem-based learning strategy aimed to educate a large number of first-year medical students on tobacco-related issues. Methods: A survey assessing students' knowledge, attitudes and beliefs was conducted before and after educational intervention. Tobacco experts from the faculty staff, who are trained problem-based learning tutors, served as facilitators in the problem-based learning setting with 1000 medical students. Results: Significant changes in knowledge and beliefs were observed. Items such as need for further training in cessation, importance, and effectiveness of brief advice showed significant variations after the educational intervention. Discussion: Educational intervention based on a train-the-trainers and problem-based learning approaches are feasible and effective to educate a large cohort of first-year medical students in tobacco issues. Further research is needed to find out whether this intervention improves overall patient care management. Smoking is a leading cause of preventable deaths worldwide. Since the ratification of the World Health Organization (WHO) Framework Convention on Tobacco Control  in 2004, Uruguay has quickly undertaken combat of the tobacco epidemic. By March 1 st , 2006, Uruguay had become the first smoke-free country in the Americas. Two years later, a national comprehensive tobacco control law was approved, which reaffirmed existing measures of smoke-free places and added others such as complete bans of advertising, promotion, sponsorship of tobacco products except at the point of sale, and higher taxation of cigarettes. This law also required healthcare institutions to deliver adequate treatment and support to smokers who are willing to quit, a service that was not widely available until recently. Thus, Uruguay has become a leading country in tobacco control, having fulfilled most of the provisions of the WHO treaty. Tobacco control measures have wide political support in Uruguay, and in fact past President Dr. Tabaré Vazquez, a leader in this health policy, is a practicing oncologist and former professor of the Oncology Department of the public Faculty of Medicine. Knowledge-attitude-behavior (KAP) surveys provide essential information to help plan, implement and evaluate educational programs as well as advocacy, communication and social mobilization. KAP survey data show what respondents know about tobacco use in this case, how the health system responded to the problem, what they think about smokers and tobacco control measures and what they actually do about it. KAP surveys can identify cultural beliefs, knowledge gaps or behavioral patterns that may pose a barrier to education or health policy. The purpose of our paper is to describe the design and evaluation of an educational intervention based on the TT model and problem-based learning strategy aimed to train a large number of first-year medical students on tobacco-related issues. We conducted a prospective, quasi-experimental study. Medical Education department teachers together with tobacco experts, who were part of the faculty, designed the problem-based learning case, its learning objectives, self-assessment and feedback forms. Experts belong to the Internal Medicine department of the University Hospital and have been in charge of the tobacco-cessation clinic of the hospital for more than a decade. It was an interdisciplinary team of three physicians, a psychologist and a social worker, who are also faculty teachers. They were trained in tobacco control issues abroad and in continuous medical education courses developed by the National Cancer Agency. This case was part of a series of six problem-based learning cases in the first-year of the curriculum. Tobacco experts held a 3-hour workshop with tutors, who subsequently acted as problem-based learning facilitators with the first-year medical students. Topics included in the 3-hour workshop were: Epidemiology of tobacco use; tobacco-related diseases; effects of passive smoking; principles of nicotine addiction; healthcare providers' role modeling; and principles of clinical intervention for cessation, especially brief advice and tobacco control policies. To measure educational impact, we used the Global Health Professions Students Survey; WHO-Center for Disease Prevention (GHPSS). , It consists of 23 multiple-choice or yes/no questions that assess students prevalence of tobacco use, second-hand smoke exposure, knowledge, personal practices, attitudes and beliefs regarding smoking and smoking cessation. Attitudinal questions assessed students' beliefs about physicians' role in influencing quitting. According to the GHPSS, anyone who had smoked at least one cigarette in the past month was considered as "smoker". The questionnaire was given to students by their tutors before and after the educational intervention. It was anonymous, voluntary, self-administered and took approximately 20 to 30 minutes to complete. Effectiveness of the intervention was measured comparing percentages of correct answers between baseline and follow-up answers to the GHPSS. Approval of the institutional board of the Medical Education department of the Faculty of Medicine was obtained. Students willing to participate signed a written informed consent form, with confidentiality of subject data ensured. Descriptive statistics were used. Answers were compared using Chi-square and Fisher's exact test. P values < 0.05 were considered statistically significant. SPSS version 17 was used. The questionnaire was distributed to 1030 students enrolled in the course, with 910 receiving it and 120 not receiving the test because tutors did not hand them out. Of the 910 students, 624 (68.6%) completed the pre-intervention questionnaire and 577 of these completed the post-intervention version (92.4% of baseline respondents, and 63% of the enrolled students). Basic demographics, tobacco experimentation rates, smoking status and willingness to quit at baseline and follow-up are shown in [Table 1]. These variables did not significantly vary between pre and post surveys, except for agreement with advertising bans. Response rates exploring knowledge, attitudes and beliefs at pre and post-intervention surveys are presented in [Table 2]. Significant changes were observed in baseline and follow-up scores. Core questions about brief advice, its effectiveness and timing showed better performance of the students in the post-test survey. Answers regarding tobacco advertising, promotion and sponsorship in post-test revealed better comprehension about these issues after the intervention. The perceived need for training rose significantly as well as the awareness that doctors must systematically provide information about smoking and cessation. However, some items did not vary after the educational activity. Knowledge of the fact that doctors who smoke are less likely to encourage their patients to quit and perception of role model did not increase after the training. Agreement with complete smoking bans in enclosed places did not significantly vary. Response rates were analyzed by gender and smoking status. No association between gender and smoking status was found at a bivariate level. Significant differences in some answers regarding knowledge and beliefs were found related to smoker or non-smoker conditions. Smokers were less likely to acknowledge physicians as role models or brief advice effectiveness. Students' positive answers to core questions by smoking status are shown in [Table 3]. Regarding gender, female students reported higher scores regarding acceptance of indoor smoking bans [Table 4]. Other variables did not vary significantly by gender at baseline or follow-up. We found a high prevalence of tobacco use among medical students (27.8%), which is, in fact, higher than that in our national general adult population of 24.9%,  but similar to medical students smoking prevalence in other countries. ,, It is well-known that most smokers experiment and begin smoking at pre-teen and teen years; in fact, the Youth Tobacco Survey conducted in Uruguay in 2010 showed an average age of experimentation at age 13.3 years. In spite of the fact that the national smoke-free policy started when the students of our study were teenagers, strong anti-tobacco comprehensive legislation was enacted in 2009. This could explain why the prevalence of tobacco use in medical students is still high in this study. In the youth survey, smoking prevalence among high school students between 13 and 18 years was 18.3% in 2010, so we have reason to believe smoking prevalence among university students will drop in the near future. In the present study, we found that smoking status negatively impacted students' knowledge and beliefs about the effectiveness of brief advice to quit smoking, role model concept and acceptance of smoke-free policy. Tobacco use among doctors is considered a barrier to the promotion of smoking cessation. This fact appears to have its corollary at the student level according to our findings. Previous studies in our country have reported a significant difference in motivation to receive training in tobacco cessation among smoker medical students (81%) versus non-smokers (90%). The fact that knowledge about brief advice was significantly lower among students who smoke is worrying, since it seems that tobacco use negatively influences the future health professions workforce to deliver effective anti-tobacco counseling. Current evidence shows that brief advice should be properly delivered to all smokers by healthcare providers irrespective of whether they want to stop smoking or not, since it appears to work by triggering a quit attempt. ,,,, Advice can be strengthened if it can be linked to an existing smoking-related medical condition, or to protecting children and young people from exposure to second-hand smoke. The educational intervention was effective in increasing knowledge about brief advice, motivation to receive training, and awareness of the physician's role in informing and counseling smokers. Enhancing motivation to receive further training is particularly important since lack of skills is a central barrier to provide proper counseling, according to several studies. ,,,, Furthermore, increasing awareness of physicians' roles in informing and advising patients is critical, because in spite of six decades of research linking tobacco use to increased morbidity and mortality, many smokers remain unassisted by healthcare systems. Our educational intervention did not modify awareness of physician role models or lack of recognition of smoking status as a barrier in doctors' performance. Similarly, Leone et al. found that attitudinal aspects like frustration with unwilling patients or attitudes toward tobacco advertising did not vary after receiving the educational intervention. Furthermore, no changes were noticed regarding smoke-free policies acceptance other than advertising bans in our study. A possible explanation of this observation may be that acceptance rates were already high at the time of the baseline survey. We did find significantly higher acceptance of smoke-free policy among women in this study. Some media campaigns in Uruguay have women as primary audiences and may have impacted this observation. Although knowledge about tobacco-issues could be easily modified by different educational activities, our study suggests that attitudinal aspects and beliefs need to be addressed through other strategies, probably involving observation and emulation of effective role models in a clinical setting. There are several study limitations. As in many educational intervention studies, practical and ethical issues mandated that the study be performed using a pre-post design within which students served as their own controls. Additionally, the survey was not answered by one-third of the total number of enrolled students, since it was not compulsory. Finally, pre and post-intervention assessment could not be matched by participant due to anonymity. This means that the results should be taken conditionally. Lack of longer-term monitoring of the outcomes prevents us from knowing whether changes were sustained, if they decreased or otherwise were enhanced by other educational interventions related to the topic. On the other hand, one of the study strengths was the ability to reach a large cohort of students, using strategies which enhance students' development of independent learning and communication skills, responsibility for their own learning, and critical thinking, in spite of a large number of students and few teachers trained in the subject matter at the beginning of the educational experience. Overall, educational interventions based on train-the-trainers and problem-based learning approaches are feasible and effective in training a large number of first-year medical students in tobacco issues. Some attitudes and beliefs were not significantly modified through this intervention and need to be addressed in other settings. The KAP model was found useful in detecting beliefs and barriers, and will help tailor future educational interventions according to these findings. Further research is needed to determine whether this intervention improves patient care management. Authors wish to acknowledge medical students Class of 2009 of the Facultad de Medicina, Universidad de la Republica and their tutors. The study received a grant from the National Tobacco Control Program, Ministry of Health. World Health Organization. Framework Convention for Tobacco Control; 2003. Available from: http://www.who.int/fctc/text_download/en/index.html. [Last cited on 2014 Jul 24]. Ministry of Public Health. Uruguay. 1s t national survey of risk factors of chronic diseases. 2006 Available from: http://www.msp.gub.uy/sites/default/files/archivos_adjuntos/1er_enfrecnt_2006_1.pdf. [Last accessed on 2016 Jul 10]. Ministry of Public Health. Uruguay. U.S. Centers for Disease Control and Prevention/Global Adult Tobacco Survey. GATS: Fact Sheets and Reports - Uruguay; 2009. Available from: http://www.msp.gub.uy/andocasociado.aspx?3885,18398. [Last cited on 2014 Jul 24]. U.S. Department of Health and Human Services. Reducing Tobacco Use: A Report of the Surgeon General. Atlanta, GA: U.S. Department of Health and Human Services, CDC; 2000. Fiore MC, Bailey WC, Cohen SJ. Treating Tobacco Use and Dependence. Clinical Practice Guideline. Rockville, MD: U.S. Department of Health and Human Services; 2000. Lancaster T, Stead L, Silagy C, Sowden A. Effectiveness of interventions to help people stop smoking: Findings from the Cochrane Library. BMJ 2000;321:355-8. Sindicato Médico del Uruguay. National Medical Survey; 2004. Available from: http://www.smu.org.uy/sindicales/documentos/estadistica/informefenc2004.pdf. [Last cited on 2014 Jul 24]. Geller AC, Brooks DR, Powers CA, Brooks KR, Rigotti NA, Bognar B, et al. Tobacco cessation and prevention practices reported by second and fourth year students at US medical schools. J Gen Intern Med 2008;23:1071-6. Strayer SM, Pelletier SL, Martindale JR, Rais S, Powell J, Schorling JB. A PDA-based counseling tool for improving medical student smoking cessation counseling. Fam Med 2010;42:350-7. Warren CW, Sinha DN, Lee J, Lea V, Jones NR. Tobacco use, exposure to secondhand smoke, and cessation counseling among medical students: Cross-country data from the Global Health Professions Student Survey (GHPSS), 2005-2008. BMC Public Health 2011;11:72. Pbert L. Healthcare provider training in tobacco treatment: Building competency. Am J Med Sci 2003;326:242-7. Martino S, Ball SA, Nich C, Canning-Ball M, Rounsaville BJ, Carroll KM. Teaching community program clinicians motivational interviewing using expert and train-the-trainer strategies. Addiction 2011;106:428-41. Corelli RL, Fenlon CM, Kroon LA, Prokhorov AV, Hudmon KS. Evaluation of a train-the-trainer program for tobacco cessation. Am J Pharm Educ 2007;71:109. Harden RM, Davies MH. The continuum of problem-based learning. Med Teach 1998;20(4):317-22. Azer SA. Introducing a problem-based learning program: 12 tips for success. Med Teach 2011;33:808-13. Albanese M. Problem-based learning. In: Swanwick T, editor. Understanding Medical Education: Evidence, Theory and Practice. Oxford: Wiley-Blackwell; 2010. p. 37-52. McKee N, D′Eon M, Trinder K. Problem-based learning for inter-professional education: Evidence from an inter-professional PBL module on palliative care. Can Med Educ J 2013;4:e35-48. World Health Organization. Advocacy, Communication and Social Mobilization for TB Control: A Guide to Developing Knowledge, Attitude and Practice Surveys; 2008. Available from: http://www.whqlibdoc.who.int/publications/2008/9789241596176_eng.pdf. [Last cited on 2014 Jul 24]. Stjernquist M, Crang-Svalenius E. Problem based learning and the case method - medical students change preferences during clerkship. Med Teach 2007;29:814-20. World Health Organization. Tobacco free initiative. Surveillance and monitoring. Survey. Geneva World Health Organization; 1998. Centers for Disease Control and Prevention (CDC). 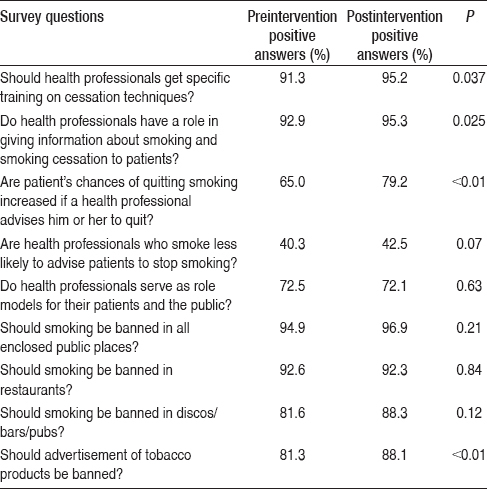 Tobacco use and cessation counseling - global health professionals survey pilot study, 10 countries, 2005. MMWR Morb Mortal Wkly Rep 2005;54:505-9. Nerin I, Guillen D, More A, Sanchez L. Study of smoking in a medical school: Prevalence and attitudes among students and teachers. Prev Tab (Span) 2000;2:166-72. Franco PV, Vera S, Juarez S. Prevalencia de tabaquismo en estudiantes de la Facultad de Medicina de la Universidad Nacional del Nordeste, Corrientes - Argentina. Revista de Posgrado de la Catedra de Medicina 2008;183:1-5. Tafur LA, Ordoñez G, Millan JC, Varela JM, Rebellón P. Prevalence of smoking among students newly admitted to the University Santiago de Cali. Med Colomb (Span) 2006;37:126-32. Junta Nacional de Drogas, Uruguay. Cuarta Encuesta Nacional Sobre Consumo de Drogas en Estudiantes de Enseñanza Media; 2010. Available from: http://www.infodrogas.gub.uy/html/encuestas/documentos/IV_encuesta_estudiantes_media_2010.pdf. [Last cited on 2014 Jul 24]. Huarte A, Torres Esteche V, Peña S, López MV, Piñeyro L, Zabert G. Tobacco consumption in medicine students. Eur Respir J 2010;36:S54. Ministry of Health. Uruguay. National Tobacco Cessation Guidelines; 2009. Available from: http://www.fnr.gub.uy/guias. [Last cited on 2014 Jul 24]. Stead LF, Bergson G, Lancaster T. Physician advice for smoking cessation. Cochrane Database Syst Rev. 2008 Apr 16;(2):CD000165. doi: 10.1002/14651858.CD000165.pub3. Spangler JG, George G, Foley KL, Crandall SJ. Tobacco intervention training: Current efforts and gaps in US medical schools. JAMA 2002;288:1102-9. Becoña E. Stages of change in smoking behavior: Its relevance in the treatment of smokers. Prev Tab (Span) 2000;2:106-12. Blumenthal DS. 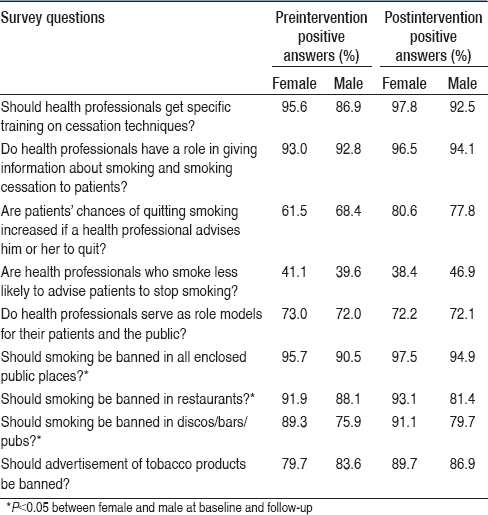 Barriers to the provision of smoking cessation services reported by clinicians in underserved communities. J Am Board Fam Med 2007;20:272-9. Crofton JW, Tessier JF, Fréour PP, Piha T. European medical schools and tobacco. Med Educ 1996;30:424-7. Thorndike AN, Rigotti NA, Stafford RS, Singer DE. National patterns in the treatment of smokers by physicians. JAMA 1998;279:604-8. Leong SL, Lewis PR, Curry WJ, Gingrich DL. Tobacco world: Evaluation of a tobacco cessation training program for third-year medical students. Acad Med 2008;83 10 Suppl: S25-8. Leone FT, Evers-Casey S, Veloski J, Patkar AA, Kanzleiter L; Pennsylvania Continuum of Tobacco Education Work Group. Short-, intermediate-, and long-term outcomes of Pennsylvania′s continuum of tobacco education pilot project. Nicotine Tob Res 2009;11:387-93.